Fused Glass Wall Decor–Project perfect for all ages. 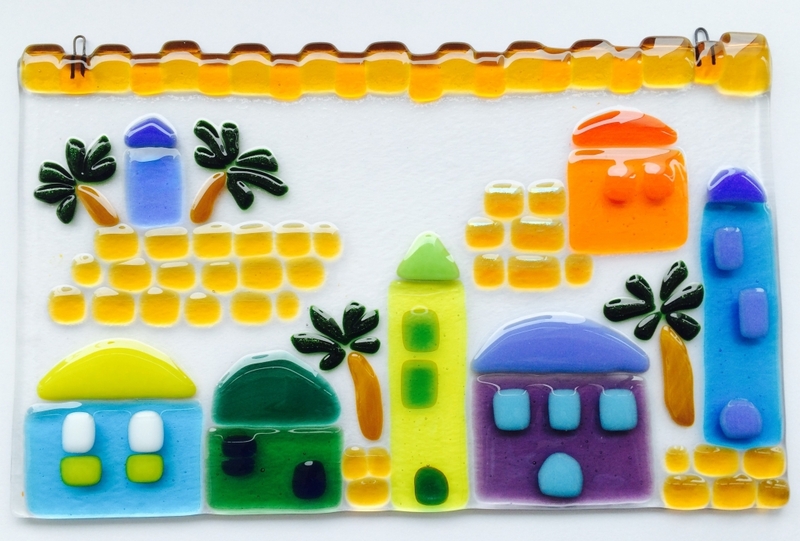 This fused glass wall hanging features a beautiful scene of Jerusalem, with the Walls of Jerusalem in Amber, colorful buildings, and palm trees, on a clear background. This artwork is contour fused for a beautiful texture so that each component piece retains its individual character, while edges are soft and rounded. It has 2 metal hangers permanently fused into the glass for hanging on the wall. This is a beautiful wall decor that will add color and light to your home. Measures about 10″ x 6 1/8″. All children under 12 must be accompanied by an adult and no one in the studio under the age of 7.